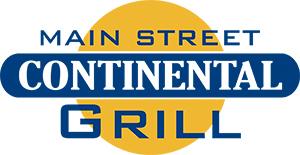 Main Street Continental – Unfussy option dishing up Mediterranean staples such as falafel & shawarma, plus burgers & hot dogs. Dine in, carry out, catering & delivery (after 5pm). $20 minimum on all deliveries. No delivery outside of Kent, Ohio. Please allow 30-60mins for delivery. One each of kibbie, meat pie, and spinach pie, and two grape leaves. Vegetarian soup made with cooked lentils with Swiss chard, celery, and sauteed onions. Cincinnati-inspired, mildly spicy chili with beans and vegetables in a tomato-based sauce. Spicy lentil soup with diced tomatoes, chickpeas, noodles and onions in a tomato-based sauce. One skewer each of the shish kabob, chicken kabob, and kafta kabob. Served with your choice of rice or tabouli. (2 skewers) Grilled top-quality tenderloin cubes of Angus beef marinated with spices. Served with onions and peppers. Served with your choice of rice or tabouli. (2 skewers) Strips of top-quality ground lean beef mixed with onions, parsley, and spices. Served with your choice of rice or tabouli. (2 skewers) Cubes of boneless chicken breast marinated in garlic, spices, and lemon juice. Served with your choice of rice or tabouli. Your choice of beef or chicken shawarma sauteed with onions and served over a bed of basmati rice. Beef and lamb gyro meat on a bed of rice with lettuce, tomatoes and onions, served with cucumber sauce. Two pieces of falafel, tabouli salad, hummus, and baba ghanoush. (4 pieces) Vegetarian patties made with chickpeas and fava beans, deep-fried, served with tomatoes, parsley, radishes, pickled turnips, tahini sauce and tabouli. A mixture of crushed wheat, parsley, onions, tomatoes, lemon juice, and olive oil, with a hint of spices. Chopped tomatoes, onions, cucumbers, radishes, green peppers and mint. Served with toasted pita bread. A mixture of artichokes, feta cheese, tomatoes, green peppers, cucumbers, chickpeas, and dressing. Mixed greens, cucumbers, tomatoes, feta cheese, onions, pickled turnips, radishes, and your choice of dressing. Your choice of marinated beef or chicken over mixed greens with tomatoes, cucumbers, feta cheese, onions, pickled turnips, and radishes. Lamb and beef gyro meat, mixed greens, cucumbers, tomatoes, feta cheese, onions, pickled turnips, radishes and cucumber sauce. Grilled top-quality ground lean beef with onions, parsley, and spices in pita bread with hummus. Cubes of marinated boneless chicken breast in pita bread with onions and tomatoes. Served with your choice of dressing: Hummus or garlic. Thin-cut marinated beef in pita bread with onions, parsley, and sumac. Topped with tahini. Marinated chargrilled chicken in pita bread with onions, parsley, and sumac. Topped with garlic. Deep-fried vegetarian patties made with chickpeas and fava beans, served in pita bread with tomatoes, pickled turnips, parsley, and radishes. Topped with tahini. Puree of chickpeas, sesame sauce, garlic, and lemon juice in pita bread with onions, tomatoes, parsley, and cucumbers. Lamb and beef rolled in pita bread with lettuce, tomatoes, onions, and cucumber sauce. Slices of seasoned chicken rolled in pita bread with lettuce, tomatoes, onions, and cucumber sauce. Choice of beef or chicken, tomatoes, cucumbers, black olives, rice and our garlic labne on a spinach tortilla. Top-quality beef grilled with onions, green peppers, jalapenos, mushrooms, and spices, with lettuce, tomatoes, and mayonnaise and topped with cheese on a roll. A double meat sandwich with everything on a 12-inch roll. Chicken with lettuce, tomatoes, green peppers, onions, cheese, mayo and garlic. Squash, cauliflower, green beans, and carrots.